Portable Document Format (PDF) is the de facto standard for the secure and reliable distribution and exchange of electronic documents and forms around the world. 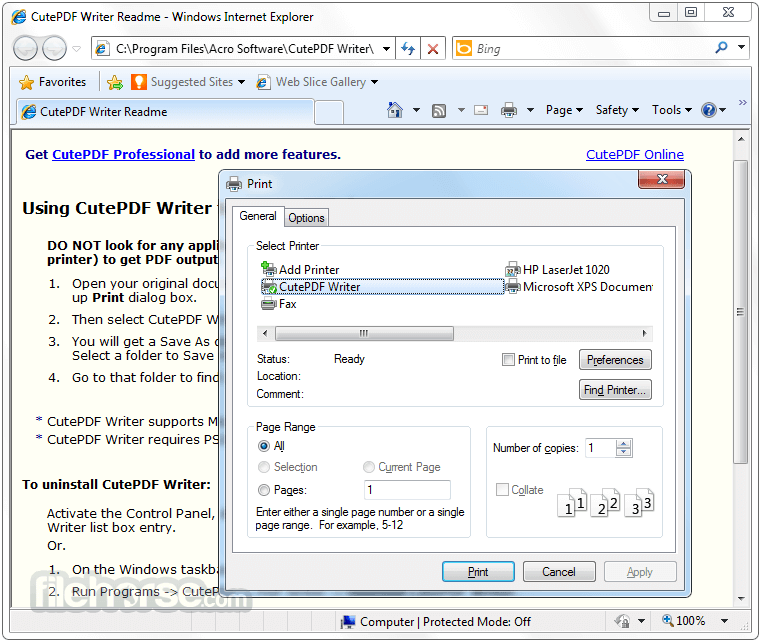 CutePDF Writer (formerly CutePDF Printer) is the free version of commercial PDF creation software. CutePDF Writer installs itself as a "printer subsystem". CutePDF Writer has no interface because the way it creates PDF files is a bit original. It's not a stand-alone application, instead it integrates into Windows and acts like a virtual printer. This means CutePDF Writer is available for all the installed programs that support printing. While testing this application it worked flawlessly every time and another great thing we noticed about it is that CutePDF Writer doesn’t stress the system resources at all. This is why dedicated software solutions for creating PDF files have been brought to life and CutePDF Writer is just one of the top names. · Added support for both 32-bit and 64-bit Windows Vista. · CutePDF Writer Companion adds free utilities to Writer. · Added support for 64-bit Windows XP/2003. · Seamlessly integrate with CutePDF Professional. · New version works with the latest version of Ghostscript. · To use with other PS2PDF application, please refer to FAQs. · Supports foreign language Windows better. · No longer include Ghostscript. You may download and install it separately. All CutePDF Writer reviews, submitted ratings and written comments become the sole property of Windows 7 download. You acknowledge that you, not windows7download, are responsible for the contents of your submission. However, windows7download reserves the right to remove or refuse to post any submission for any reason. Windows 7 Download periodically updates pricing and software information of CutePDF Writer full version from the publisher, but some information may be out-of-date. You should confirm all information. Using warez version, crack, warez passwords, patches, serial numbers, registration codes, key generator, pirate key, keymaker or keygen for CutePDF Writer license key is illegal and prevent future development of CutePDF Writer. Download links are directly from our mirrors or publisher's website, CutePDF Writer torrent or shared files from free file sharing and free upload services, including Rapidshare, MegaUpload, YouSendIt, SendSpace, DepositFiles, DivShare, HellShare, HotFile, FileServe or MediaFire, are not used.